Last week I was sent to London for work for the whole week, I couldn’t be happier ! I had the opportunity to meet Dena for the second time and also make a lot of Christmas purchases, some of them insanely cute, some also insanely expensive ! I will be reviewing most of them in the near future, I added swatches for some of them but I’ll add more when the products will be reviewed. Shopping before Christmas can be extremely upsetting because every where you go it’s awfully busy ! at least you get some benefits, many departments stores were having special “before-Christmas” day sales and wherever I purchased, Liberty, Harrods, Selfridges, House of Fraser, John Lewis, etc… I was always getting at least 10% discount and nice gifts with purchases. First of all, the cutest of all purchases, can you guess what it is ? It’s the best advent calendar ever ! I was browsing the beauty counter in Selfridges London with Dena and I literally went crazy when I saw this ! there was no way I would get out of there without it ! It’s so fun to get up in the morning and open the corresponding window !!! Nobody, ever, could get as excited as I am about it 😛 I am such a child !!! When I saw this bronzer for the first time in Geneva it seemed too shiny and unnatural but when I tried it in London I liked it, depending on the application it can really deliver a healthy glow. It will be reviewed later on. This La Prairie foundation was a huge shopping topic during my trip. I could not find a good match for me, the first time I had it applied on my skin I did not like it, but after 3 hours of wear it turned to be flattering, I noticed that it was revealing a beautiful, healthy skin and that it the reason why I got it. I still struggle to master the correct technique to apply it but I’ll get there. This week I tried it several times, one day I even had to take it off since it looked like a thick mask, today I tried a different application method, with the Koyudo BP013 and it worked well, most of the people I know apply it with their fingertips which is a nice way to do it, but I don’t like it for me. Foundation application is a very tricky thing, you may think that a similar application technique would work for most foundations but this is sometimes wrong. It’s a bit like driving, the more you drive, the less attention and care you tend to pay to what you do and how you do it, always consider changing, updating or adapting your habits in order to get a product work best for you ! Unfortunately today I have huge wrinkles on the forehead and also fine lines and I realized recently that this was making me a bit sad… I even started to think about doing something more drastic but I am a bit scared of needles to say the least, I’ll try to avoid it. Dena told me about the Murad serum so one evening I went to the Murad counter and they applied a few of their products on my face, eyes and lips, went back to my room and a few hours later I could already notice that my skin was feeling more plumped and that something was actually working nicely and acting on my deep wrinkles. Right now I am testing the Murad serum (Intensive Wrinkle Reducer (face and eyes) and the Soothing Skin and lip care balm. I will keep you updated but so far so good, I can see a clear improvement although it has to carry on improving otherwise it will not be worth its price tag. I use Bobbi Brown long-lasting makeup remover for the eyes on a daily basis but I am now testing Shu Uemura cleansers in the evening to remove the rest of my makeup, my skin feels good but it’s a little bit more time consuming than just using the Bioderma water. I had the #12 and wanted the #10, but I ended with a few more !!! I will make an in depth review of these. I initially wanted the cheek (full squirrel) brush but every time I asked for it it was sold out. This time it was there waiting for me and it has now joined my RMK brush collection ! On the top the squirrel/goat, at the bottom the full squirrel one. The blended one (goat/squirrel) has the S engraved at the bottom. Some years ago, somebody told me that my Suqqu brush had to be the M one because the S was long discontinued and that it would be very unlikely that I had it, so I supposed the one I had in my collection was the M.
I still wasn’t convinced so this time I took my own Suqqu brush to the Suqqu counter and they confirmed that my brush was actually the rare and discontinued “S”. The good news is that I have the S, the bad news is that in all my past posts I always pictured my “S” brush to be the “M” 🙁 not good !!! You know I love Suqqu makeup and I am heart and soul devoted to this brand, I got the two holiday sets with the cute packaging, white-silver for one and white-gold for the other. The blushes are the two gradation cheeks from Fall 2012. I also picked up a few lipsticks that I am using on a daily basis now. 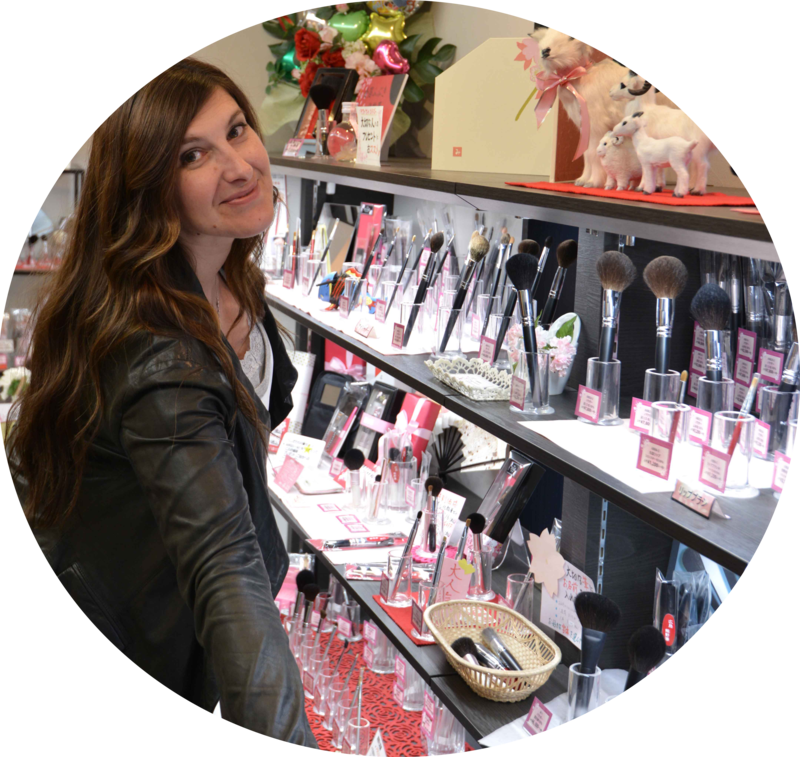 I could spend hours at the RMK counter, discovering their products, unfortunately it was really busy so that wasn’t easy at all. I got a few things, including the Christmas 2012 set. The last day I bought my first two matte blushes from RMK, the MT-05 and the MT-04, I am wearing the MT-04 today and it’s one of my new favorites. I saw the MT-08 (that is a shading/contour blush) and I wanted it so badly. I have already ordered it and I will review this matte range when I get it. I wanted to try the RMK Separate curl mascara and there was a small size one included in the Christmas set I bought. I am seriously looking for an HG mascara so I also got the Extra Deep W mascara. Both RMK mascaras perform well, the separate curl makes my lashes look longer and holds better the curl, the Extra Deep makes them appear slightly thicker but slightly less curled and less long. I am deeply loving both but I prefer the separate curl. Have you tried their RMK waterproof pencil eyeliners ? I got the brown one, it lasts all day and it has a fantastic texture, I will shortly compare it to the Addiction. John Lewis had a GWP when you purchased 3 items, I wanted the two eyeshadows pictured here (Chestnut and Antique Rose). I got the third item and received a full size cleanser, a beauty bag and a mini lipstick. The lip liner is amazing ! I am in love with it, it’s the 02 Dusty Rose, creamy but not too much, precise and when you fill your lips with it it’s evenly applied and very comfortable, the problem is that it’s not that long-lasting but I am ready to live with it. I mix it with Suqqu creamy lipsticks and it’s just the most stunning combination I have, flattering and beautiful. I wanted to try their blushes, I am loving Nectar and Rose, not very convinced of their lasting power but I’ll double check that soon. I wasn’t sure about this blush in shade Sophie, you can see many sparkles and I am always afraid that they will show but it turns up to be very wearable and I love it, a very nice surprise. This is an item I wanted to see in person before I purchased it and when I saw it, I had to have it. It was either this one or the new Guerlain Wulong, the Chantecaille wins for me, Guerlain is more dupeable than this Chantecaille, although I am pretty sure that the Guerlain packaging feels more solid than this one. I always pay a visit to Becca in Fenwick, they have a few new palettes but I wasn’t very impressed with the shades. I also always check out this brand when I am in London, I found this palette that had interesting pans. The black and bordeaux are really pigmented and of very good quality, totally worth it. My visit to the Inglot shop was short, I have just picked 4 eyeshadows and a palette to put all my other Inglot pans together. Maybe next time I will take another empty palette to put my Nars depotted duos, it’s not exactly the same size but they fit. One recommendation that I can give you if you are looking for a good Inglot matte eyeshadow and you are undecided, then swatch them on your fingertips and compare them side by side, you will notice a clear difference between the matte textures, some are more powdery and chalky than others and that’s a good way to find out which ones are the best. Same thing applies to the other textures, some shadows are better than others, when you swatch them together you will be able to detect which ones are best and that’s how I selected mine. I got the brow pencil in Chestnut, easy and fast to use, that’s what I love about it. Occasionally I like to wear false lashes but the application is a nightmare if you are not used to do it. I got these two tools to try them (Shu Uemura and Bourgeois). The Bobbi Brown bottle that you see here is the brush Cleaning Spray, I tried it with my eyeliner brushes and it works like magic. I will use it for that purpose, I apply eyeliner on a daily basis and this allows me to spot clean my brushes very quickly. I think I will also use it with foundation brushes or cream blush brushes. Another mandatory visit is to the acrylic counter at the bottom floor of Selfridges, they have great organizers and this is their new one with drawers that you can either use vertically or horizontally, excellent idea. Some of these items will be reviewed in the near future, I need some time to try them properly and give you more details and a more precise opinion. Christmas beauty purchases in London and sneak peek of future reviews was last modified: August 19th, 2013 by Sonia G.
Sonia, what a visual treat! I got quite excited about Christmas looking at all your beautiful purchases — especially love the calendar. I think there is a child in all of us even if we have a few wrinkles! What a teaser post!!!! I want to know about everything!!! The advent calendar is genius! There is also the Astalift eye cream mini in the Astalift mini-products I bought, but I am going to try this Murad first for these 2 following weeks, I have very high expectations ! You are so lucky to go to London in December! I am really looking forward to your reviews of Shu brushes….. I will be reviewing these brushes very shortly ! I wanted them for a long time and I am so happy I got them, really enjoying them ! what a nice haul ! Ciaté makes every year a beautyful christmas surprise, several years ago I got their hat box, back then it was a really hard to find, niche brand, I’m glad they’re now more readily available and have more colors. Did you try the anti-aging La Prairie foundation ? I’ve tried a sample of it and don’t remember It was so difficult to work with (http://www.laprairie.com/lp/prod/en_au/category/colour/face/Anti-AgingFoundationSPF15+/999999998003.html). As for wrinkles, I’ll have a look at the murad line, I have the lion wrinkle, I fear needles too but I’m afraid nothing else really works on this one. I love the shade Apple Custard. I’m such a freak though, as soon as things become easily available they lose their interest for me. Now I love the Le Metier polishes:) I think I need therapy!! I just recently discovered Ciaté, I had only one beige-pink nail polish and although I don’t like this shade a lot, while I was in a shop in Geneva somebody asked me what I was wearing ! That doesn’t happen to me often ! I am happy I can try many different colors now! I asked the assistant which one I should go for and they recommended the caviar for my dry skin. Today I am wearing it and I finally managed to master the application, well not completely yet but flawless enough (without dry patches), and I have to say that I love it more each day ! The Murad helped, after a few days I see a clear improvement but you are right, this lion one is deeply engraved ! I love London, it’s the perfect place to go shopping! I use to live in the UK, I went last year with my boyfriend and he went crazy because all the shops I went in! Also I am going to make a Hakuhodo order shortly, I am going to order a couple of Jseries to try them on, the 220 and the 5523, along with some others, I like to thank you for all your reviews,they are so helpful to make the choice. I have the beauty blended and I have to try it again, it’s just because it’s not fast enough that I don’t use it but I haven’t tried it yet with La Prairie, I will have done it and I will be ready by the time I review it ! You are very welcome ! I am sure you will enjoy them, I am really in heaven with them ! Keep on trying with the LP foundation. I don’t just use my fingers with it. Firstly one needs very little as it spreads sooooo easily. Once I’m done with spreading, I use my Koyudo Xmas FuPa or the blending sponge to make sure that their are no areas which are looking patchy. What shade did you end up with? I also recieved a few of the MUJI acrylic boxes this week & am really thrilled. I had ordered online & the perspex is much thicker & better quality than I was expecting. Unfortunately the one you got was out of stock, but I will def. go back for it. Hi Buggsiebee ! I hope you are not drowning with all the work you have ! I am loving it more and more each day, I knew I had to get it, funny how my skin remains radiant all day long, I just hope the dry patches will not appear after a few more days using it ! I ended up with Honey Beige, a tiny tiny bit dark for me but no foundation lines whatsoever, I am just not used to wear a foundation that leans more on the darker side of my skin than the lighter. Where did you order your Muji boxes ? they are much better quality than any other acrylic boxes you can find here, that’s why I always get some in London. Well, you know, my little appartement-flat was sooo cold, the big window (that was same size as the wall) was not wind-proof at all and I could not heat my room more, my room was ice cold and I wasn’t looking forward to get back to it in the evening ! Shopping till 10pm it was ! then directly straight to bed ! I am happiest with LP Honey Beige too, but Sand Beige & Golden Beige are also ok. If I feel the foundation is too dark, I powder some bronzer on my neck & it looks much better. Rather too dark a foundation than too light. I don’t know exactly what the deal is with the LP because one uses so little, but somehow it’s sticks around & looks good all day. It gives me no dry skin at all & I don’t need a primer under it either. It’s definitely a ‘my skin but better’ product. I got the Muji at Muji.de. The parcel was ENORMOUS. They package soooo well. I’m also loving the TF eyebrow pencil. It has almost taken over from my trusty Ellis Faas 104. The TF is so easy to use, but the EF still lasts longer. I’m keen to get the Hourglass Arch Sculpting brow pencil now too. It looks similar to the TF, but the Raeviewer claims that it’s even better!! I don’t think it’s so readily available yet though. I’ll have to wait till I get to NY in Jan & pay Barneys a visit. I have to check that Houglass brow pencil ! I have tried their lip stain on the back of my hand and it lasted forever ! I did not get it because I did not like the shades their had but the lasting power is out of this world ! Hahaha, ….LOVE the cargo boat:D So funny & sooooo true! I can bring the Hourglass pencil back from NY for you if you like but we’ll need to decide on the right shade for you first. Otherwise, I’ll get it, test it & if it’s interesting enough you can get your own when you’re in the US:) I’m sure it’ll arrive at Zuneta at some stage anyway. Did you get any of the Edward Bess quads? so you have an Hourglass lipstain ??? 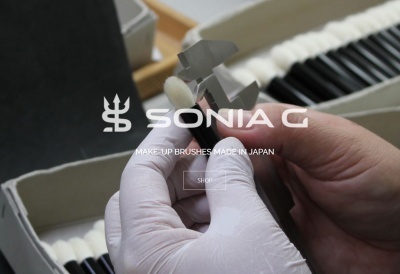 I have three of the Hourglass lipstains….you know me Sonia…..but Flush is the winner!! I only got 2 of the EB ( cosmic bliss & over the moon ) . PS….I got the RMK eye shadow in 09 ( gold-brown ) on your recommendation & have you noticed that colorwise it’s pretty similar to TF Cognac Sable? PS : yes I have just checked the RMK, you are right it’s similar to the Cognac Sable 🙂 well spotted and thank you !!! Hi Mandy ! It’s inside the Selfridges departement store in Oxford Street (Bond street tube station) in the beauty floor (ground floor) but you have to ask the information desk because it’s a bit hidden in the middle of other brands. 😀 I’ll do my best ! Wow, Sonia! What beautiful and envy-enducing purchases!!! Oooh, I can’t remember whether I told you, but I received my RMK Mix Cheeks just before I went. It’s so beautiful… but… it doesn’t really show up on my skin atm 🙁 I’m hoping come winter, it will work. For now, I just have to admire it in the pan. I’ve also been testing the Koh Gen Do Aqua foundation over the past week and I’m very happy to report back that so far, so good. I love it! I wore it on a day when it hit 34C and above, and I did a lot of walking (shopping) and my friend told me at the end of the day, it still looked fantastic. Glowy in a nice way despite the heat and its wear was still excellent in spite of the heat. I’ve also been looking around for the Chantecaille Contour Fill… it’s all sold out in Australia, even in the warehouses of our only Chantecaille stockists. I really hope it gets back in stock soon! What a shame about the RMK blush, can you at least use it as a highlighter ? I was able to get a backup of the Chantecaille some time ago and I try to not use it all the time, one is getting so tiny that it’s nearly impossible to sharpen.. I like that, it feels good to finish products ! Which RMK mix did you get? I have to say that it has fast become my favorite blush, and I find myself choosing my make up just to suit my blush lately (had never been the case before, lol), so I really hope it will work for you! I think I can probably use the lightest two shades as a highlighter. Otherwise, patience is a virtue and I will wait to winter. KGD is really nice, so much that I asked a friend to pick up the Premium Pressed Powder for me. I don’t often use powders, but come summer, I do become a little oilier around the nose. There are too many things tempting me! I hope the Chantecaille becomes in stock soon. I’ve been wearing some RBR lipsticks from my last order and I really think I NEED the Contour Fill! Oh, don’t talk about this inability to just stop at one foundation even if we’re loving it…. I just ordered the Tom Ford Traceless Stick. I wanted the liquid actually, but…I haven’t got a stick foundation and the novelty of it overcame my original preference for the liquid haha! I’ve been meaning to try the CdP too… must. stay. away. Hence, why I picked up Ravish! So excited… sometimes I think I just use the fact that products that don’t work on me as an excuse to pick up new ones to make myself feel better. I really liked Wicked as well so that’s on my list as well… but I’m trying to find a coral or coral-pink blush now after RMK didn’t work. I love coral, but I haven’t really found one that works yet sigh. Flush was what I actually wanted to try, but somehow it just didn’t work..and it was such a lovely colour too. Bonnie, I just had to come back to let you know that this has only been day one of wearing the KGD Aqua foundation, but I’m pretty impressed and at this point agree with you! I’m very very happy at this point, but will need to give it a couple of weeks to make sure my skin loves it too (my skin is finicky that way, but never in a straightforward manner – nope, it takes it’s sweet time, lets you fall in love with the look of a product, and THEN decides to freak out on you!!!! 🙁 ). Still, first impression is VERY positive, and I’m so glad I picked it up, even though it so wasn’t planed, lol! Interesting, you have my summer coloring (EF S104 – S102 in winter)! Right now I’m a BE1 in the KGD, but I can see how I would be an OC2 in summer, and probably mix both in spring and end of summer into the fall (if I haven’t moved on to the next foundation yet again by then, that is :D). I’ve never used a stick foundation either, and will totally be looking forward to your review of the TF!!!!! I almost tried the liquid one the other day, but managed to get a grip on myself just in time, lol. I’m curious about the D&G ones (both liquid and cream) lately, but hope I can resist a bit longer and just enjoy the KGD for now ;). Such a shame on the RMK mix color not showing up, it’s such a beautiful one! But I’m pretty sure it will be lovely on your winter skin, such a beautiful soft coral! On the bright side, it will, be something to look forward to for when winter comes around (which is not really something to look forward to in and of itself!)! Flush didn’t work on me either, and I have finally completely given up on corals and embraced the pink :D. I’m keeping Wicked on my to buy list for next summer, when I can wear it without fear, on my darker than now skin :D. Plus, it keeps me focused, which is good, lol! Although, I will need to have a closer look at Ravish now…. I’m so glad you liked the KGD! As for the shades, I could probably go a little lighter than OC2, but I bought it unseen and I’ve heard that their shades are hard to match. Since I was looking for a summer foundation anyway, I decided to go with the OC2. It works quite well, but if I want it slightly more… luminescent, I could probably add in a drop of a lighter foundation to mix. I’m loving the finish of it though! How exciting! I’m so looking forward to your reviews on these beauties, especially Suqqu Hanamori palette and RMK matte blushes as well as Shu Uemura brushes. For the rest, it’s slowly being prepared, unfortunately my computer died and I lost many things, my boyfriend has just ordered a new killer computer for me as my Christmas present so I’ll be posting more regularly afterwards ! Wow Sonia, what a haul!!!!!!! Merry Christmas to you, LOL! I can’t wait for all your upcoming posts with details on each and every goody you got, and also to see if you have the same assessment of some that I also have in my stash ;). I love that Muji acrylic case you got – I have it too, and I have already made use of it both vertically and horizontally. I also love the BB brush cleanser, amazing how clean it gets all brushes without really wetting them, and that you can reuse your brushes immediately. I particularly love it for my foundation brush, as I can’t wash it everyday, but hate using it when not clean. With this, problem solved! Another daily brush cleanser I’ve been testing lately, and that is almost as good as the BB one, is the one by Japonesque, called “Professional Brush Cleanser – Parian Spirit”. It smells quite strongly of citrus upon application, but the scent doesn’t linger on the brushes, and it is much cheaper than the BB cleanser. I am (of course, lol) particularly looking forward to your RMK blushes reviews!!!!!!! I’m a little worried about your Suqqu review though – with Sandy and all, I ended up passing on the Xmas specials, and hope I don’t regret it! I am particularly intrigued by the EX-08 Hanamari though, and my only consolation is that I didn’t know about it, so it probably wouldn’t have been part of my order anyway ;). I LOVE the gradation cheek in the bright pink, and have been using it quite a bit (I love how bright and sheer and not over the top it is, all at the same time). Sonia, I’m so sorry your computer died, what a major annoyance :(! So cool that your BF is getting you a new one though, and I hope you will love writing all your reviews on that one! I just hope you get it fast, as I’m totally looking forward to all your future posts on everything :)!!!!!!!!! I have started to use the Muji, the Burberry eyeshadows and the little Givenchy blushes, or Laura Mercier blushes fit just perfectly inside! Thanks for the brush cleanser recommendation, it’s always useful to know what other products are in the market and even more when they are at better price. Shu brushes are scary, scary in a good way, I hope my review will help you get a better idea of them and thanks for sharing your experience with them. Well, if we can make you feel better, then it’s a good thing that I decided to start the blog 😀 I hope that all readers feel the same and are not freaked out! Oh, it’s definitely a good thing you started this blog Sonia!!!!! Now I have someone to blame for every new make up purchase, LOL!!!!!!! Just kidding, but it’s always such a pleasure to come here and read about everybody’s experiences and be able to exchange with all you lovely Ladies! And I love reading your reviews – they are always spot on and genuine, so refreshing! And LOL, you are right: I do make all those faces while writing ;)! I really hope your trip to NY in January happens, and that we get to meet, along with Stacy: how fun would that be!!!!!! I haven’t had time to play around with it recently, so it’s just sitting looking lovely and scary all at once. I just had to get it when I knew it was still available here, it’s something about attaching a “LE” and “Sold Out” tag to things….